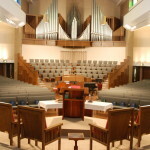 Wellshire Presbyterian Church in Denver, Colorado offers a traditional Presbyterian worship service on Sunday mornings. For many who visit Wellshire, our traditional worship service combines familiar memories of the past with engaging worship sermons that are relevant for today’s times. Traditional worship on Sunday morning is a powerful experience. It’s a beautiful way to come together as a Christian community and express our love for God on the day of the Resurrection. In our traditional service, we use the same order of worship — litany, scripture and hymns — as the reformed Presbyterian Church has used since the 16th Century. Our ministers wear full liturgical robes, and our formal liturgy comes from the Book of Common Worship of the Presbyterian Church (USA). We are committed to beautiful choral singing and music in our traditional worship service to joyfully praise God and preserve the rich choral heritage of the Presbyterian Church. Our 65-person Sanctuary Choir fills Wellshire Presbyterian Church with harmonious singing. Beauty in worship and song brings glory to God, and the Sanctuary Choir strives for beauty and excellence through every musical note. Our traditional choir is often accompanied by our 55-rank Casavant pipe organ, our Steinway and Yamaha grand pianos, or a fine orchestral ensemble. The music we select for our traditional Presbyterian worship represents the finest church music that can be chosen from different time periods. It ranges from sacred works of classical composers (such as Bach, Handel and Mendelssohn), to rousing African American spirituals, to modern-day hymn arrangements. If you are new to Denver, Colorado or just new to our church, we welcome your visit! Please learn more about visiting Wellshire Church.